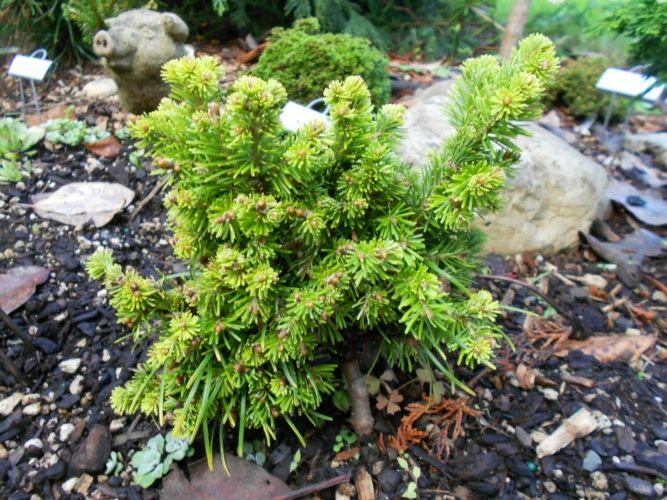 Abies sibirica 'Liptovsky Hradok' is a very small, globose and irregular selection of Siberian fir. It is noted for short, greyish-green needles of variable lengths throughout the plant and large round light-brown buds. This scarce plant was first listed by the Edwin Smits Nursery of Volkel, Netherlands, in 2009 and has been very slow to establish in the trade. Liptovsky Hradok is a town in Slovakia, not Siberia, presumably the locale where it was discovered. Since Siberian fir is native to northern Asia, hardiness is obviously not an issue. However, like many firs, 'Liptovsky Hradok' tends to suffer in extreme heat. Planting is a sheltered location is recommended for this reason. It would likely perform best within hardiness zones 2 and 5. Liptovsky Hradok, one of the featured miniatures at Glacier's End Arboretum, Olympia, WA. This 5-year old specimen was 4 inches tall and wide when this photo was taken in 2013.